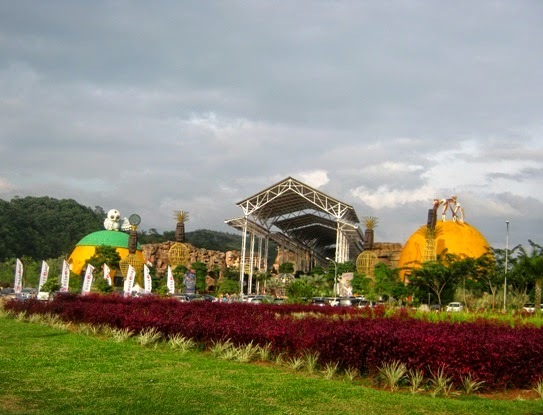 I’ve shared the blue sky above an adventure theme park Jungle Land (Sentul City Bogor, West Java, Indonesia). It turned out that the bright morning changed into gray afternoon that day. The weather encouraged us to leave the place. The pic was taken from the parking park. The grey sky makes the other colours pop! Nice photo with beautiful colors, I like this place! What a pity the weather changed into gray again. I can imagine how you felt, we had a mostly cloudy winter overhere too. Looks like a fun place, sorry the weather chased you away.. Great shot, have a happy weekend! The gray skies make a great backdrop for the colorful park. That's a pretty place, so many flowers. It is a lovely photo Lina, the gray skies are very dramatic looking. Beautiful sky and colorful scene.